In the past few years, Greece has remained at the center of the euro debt crisis. 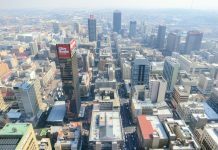 The country spiral into economic crisis has persisted with elevated levels of borrowing. The national debt of the country stands at 179% of its GDP, among the highest in the world and second only to Japan among western nations. 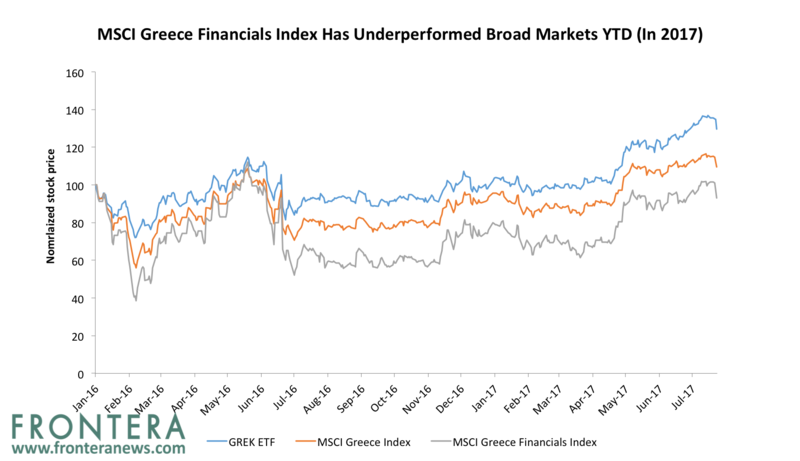 The Global X MSCI Greece ETF (GREK) is up over 27% YTD, while the MSCI Greece Index has surged 17%. 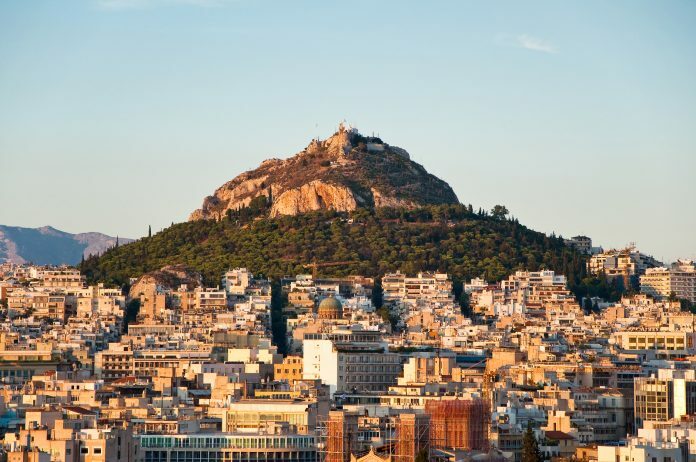 The Greek ETF is heavily weighted towards four of the country’s major banks (Alpha, Eurobank, National Bank of Greece and Piraeus), who together make up 32% of the ETF. These banks have gained 28% on average YTD. 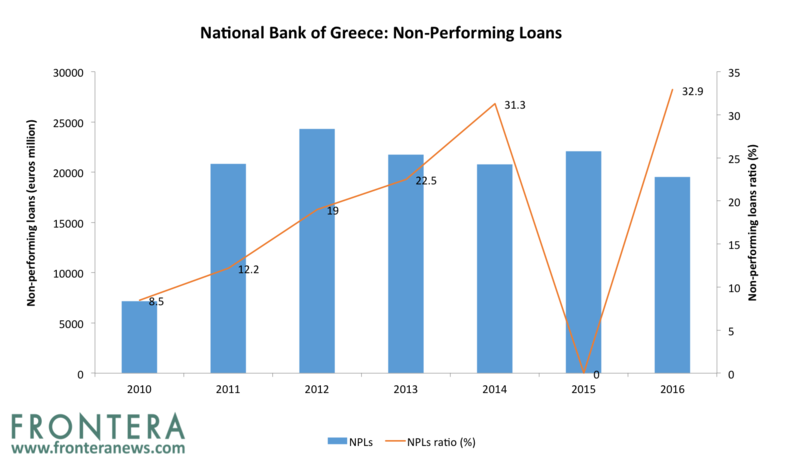 Banks in Greece are plagued by elevated levels of non-performing loans (NPLs). NPLs currently form 37% of gross loans in Greece. Since 2015, the country has been working towards cleaning up NPLs but progress has been slower than expected. The government recently adopted a policy for the sale of NPLs but it still needs to be implemented fully. 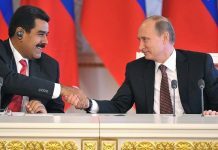 Bank sources have stated that NPLs have grown as much as $2.3 billion (2 billion euros) since the beginning of 2017. Although payment delays declined in 2016 compared to 2015, much still needs to be done to boost the banking sector. Liquidity in the economy has reached fresh lows as Greek banks show an inability to manage their bad loans. Further, bank lending has also slowed to record low levels. In May 2017, $9.95 billion (8.5 billion euros) worth of loans were recorded, significantly lower than $11.2 billion (9.6 billion euros) lent out in May 2016 and $12.9 billion (11 billion euros) in May 2015. 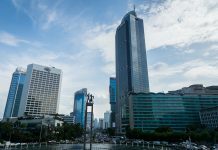 High levels of NPLs are limiting the ability of local banks to provide credit to enterprises that in turn hinders investment in the country. Banks are now trying to write-off or sell their bad loans to meet their NPL targets. The four largest Greek banks have $120.5 billion (103 billion euros) in non-performing loans on their balance sheets. The balance sheet picture of Greek banks remains vulnerable with non-performing exposures equating to 37% of total loans. These banks have laid out plans to reduce their NPLs to 20% by 2019. Write-offs of loans rather than liquidations, collections and sales will be the primary driver of this reduction in NPLs. Towards to end of 2016, write-offs of bad loans rose to $2.9 billion (2.5 billion euros) and peaked at $1.7 billion (1 billion euros) in January 2017. 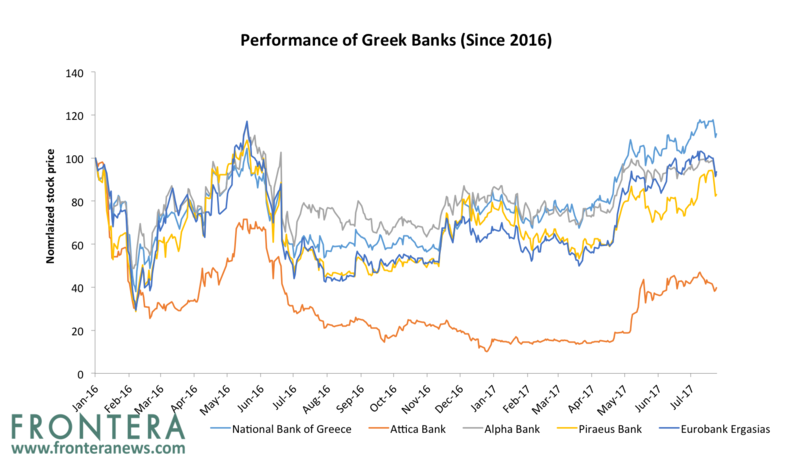 Non-performing loans will remain a major challenge for Greek banks as the NPL ratio for these banks hasn’t budged much since the 2015 debt-crisis. In December 2016, non-performing exposure of Greece’s four largest banks was 44.8% at $124.4 billion (106.3 billion euros). The ECB’s Single Supervisory Mechanism plan has set 2019 targets for Greek banks to reduce their NPLs. Piraeus Bank is required to reduce NPLs by 58%, NBG by 50%; Alpha Bank has a 48% reduction target; while Eurobank Ergasias’s (ERUOB.AT) NPLs must be cut by 37%. By the end of 2017, these banks are required to achieve 25% of this reduction, 35% in 2018 and the rest in 2019. 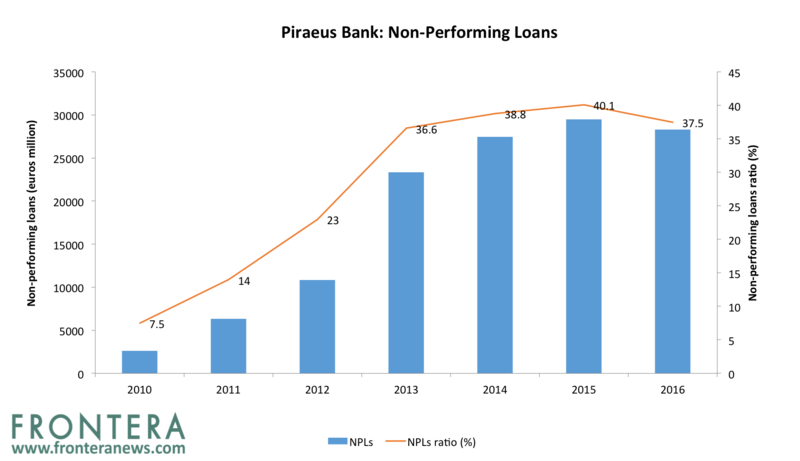 While Piraeus bank (TPEIR.AT) has been able to reduce their NPLs ratio the most, Alpha Bank’s NPLs to gross loans ratio has been growing. All banks appear to have sufficient reserves to cover their potential NPL losses. Most of these reserves are in the form of cash, which is a strong point as collateral is subject to volatile market prices. 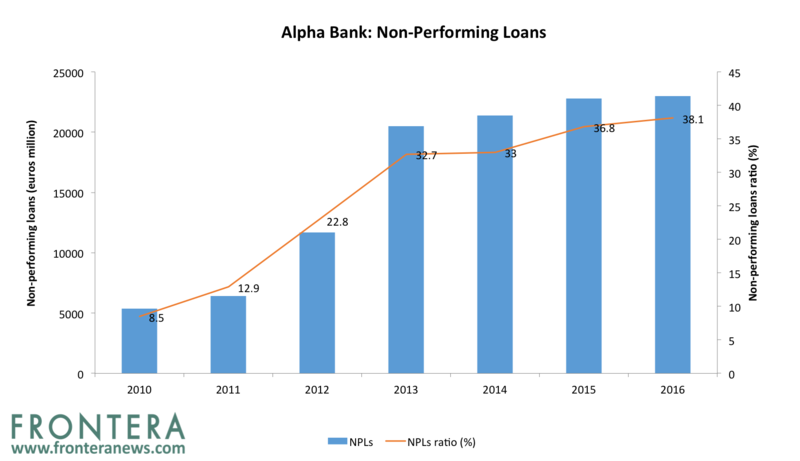 In 2016, Alpha Bank (ALPHA.AT) recorded an NPL ratio of 38.1% with a total NPL value of $26.9 billion (23 billion euros), $234 million (200 million euros) lower than the previous year, primarily due to sale of its Serbian operations. The bank’s total non-performing exposure stood at 53.7% in 2016. Alpha Bank (GD.AT) is listed on the Athens stock exchange since 1925 and has a market capitalization of $3.9 billion (3.4 billion euros). YTD shares of the bank have gained 14.7%. National Bank of Greece (ETE.AT) had NPLs of $22.8 billion (19.5 billion euros) in 2016, and an NPL ratio of 32.9%. The bank’s NPLs declined nearly $2.9 billion (2.5 billion euros) but NPL ratio increased by 1.6 percentage points. NBG has successfully reduced the majority of NPLs through loan restructuring measures for retail clients of the bank that cannot repay their debt. National Bank of Greece is listed on the Athens stock exchange since 1930 and has a market capitalization of $3.8 billion. YTD shares of the bank have gained 44.7%. Piraeus Bank, the country’s largest bank by assets, reported NPLs of $33.1 (28.3 billion euros) in 2016 and NPL ratio of 37.5%. The bank’s NPLs declined by $1.4 billion (1.2 billion euros) while its NPL ratio reduced by 2.6 percentage points. Piraeus Bank recently signed an agreement to sell $50.3 million (43 million euros) worth of NPLs. The sale will cut the NPL ratio of the bank’s Serbian subsidiary Piraeus Bank Belgrade (PBB) by 8 percentage points to 17%. This transaction follows the sale of loan portfolios worth $400 million in Romania and Bulgaria over the last 18 months. The bank expects 2017 profits to be supported by a pick-up in the Greek economy, a reduction in non-performing loans and an increase in deposits. Piraeus Bank is listed on the Athens Stock Exchange since 1918 and has a market capitalization of $2.5 billion. In 2017 so far, shares of the bank have gained 17.2%. 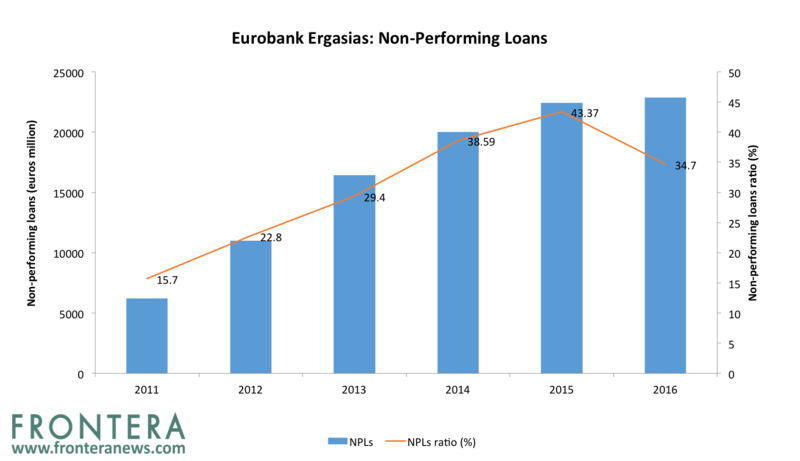 Eurobank Ergasias recorded NPLs of $26.8 billion (22.9 billion euros) in 2016, and NPL ratio of 34.7%, nearly 9-percentage points lower than the previous year. Among its Greek peers, Eurobank has the largest international exposure with nearly 29% of operating income from foreign countries. The majority of the countries in which the bank operates are in a better shape than Greece, and have impacted Eurobank’s profitability positively. Eurobank is listed on the Athens stock exchange and has a market capitalization of $2.4 billion. YTD shares of the bank have gained 48%. 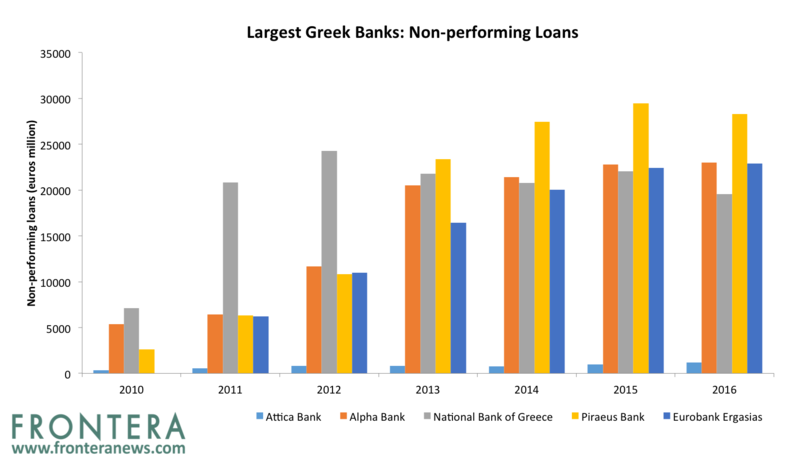 Even when the largest Greek banks have been struggling to reduce their NPLs, Attica Bank (TATT.AT), one of the smaller banks, has become the first bank to use securitization as a method to reduce its non-performing loans. Attica has turned to Aldridge EDC Specialty Finance, an investment firm, to securitize $1.5 billion (1.3 billion euros) worth of NPLs that will result in reducing its non performing exposure (NPE) by nearly 50%. Attica Bank recorded $2.8 billion (2.4 billion euros) of NPEs in 2016, equivalent to 61.8% of its gross loans, the highest among Greek banks. 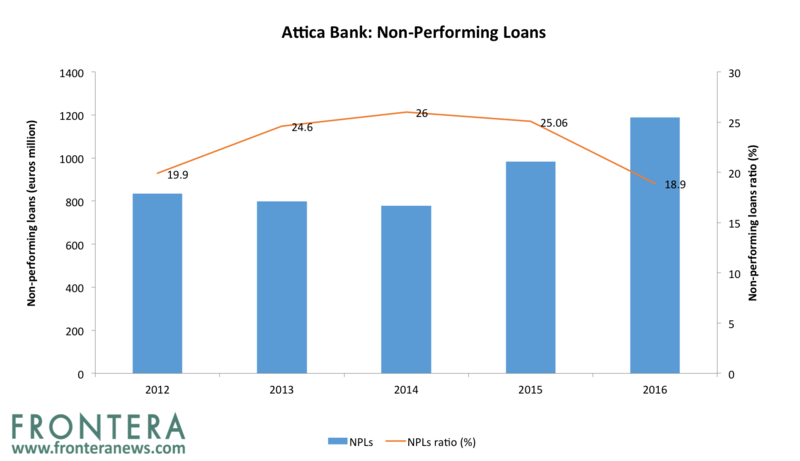 After the securitization, Attica Bank expects its NPE ratio to fall to 39.5% and its NPL ratio to decline to 33% from 50% in 2016. Stock markets welcomed the new development leading to a 7% surge in the bank’s stock price in the last one-month. YTD, shares of the bank have nearly doubled. Valuations of Greece banks are currently attractive with most still trading at a fraction of their tangible book value. Piraeus Bank with a price to book multiple of 0.2x is trading at the biggest discount although Eurobank is a close second with a PBV of 0.35x. 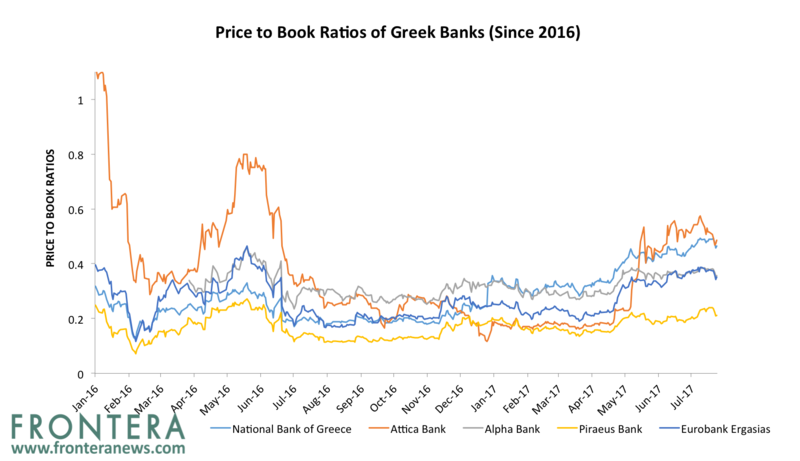 National Bank of Greece, Attica Bank and Alpha Bank are currently trading at price to book multiples of 0.46x, 0.49x and 0.36x, respectively. Next articleWhen It Comes To Regulation, What Exactly Is A Cryptocurrency?